Atlanta residents, Alice and Melissa recently renovated their kitchen to create more space and functionality. Alice describes their design aesthetic as Cottage Practical, as they wanted their kitchen to feel open and ergonomic. They appeared to have achieved just that. Both Alice and Melissa are more than satisfied with their kitchen remodel. The pretty blue backdrop makes all the difference. Alice says, "We wanted to retain a cottage appeal but add a touch of color. 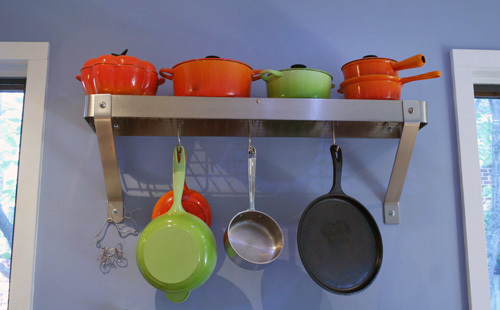 Plus, we needed a complementary backdrop for our flame colored Le Creuset collection. I love how the bright, hanging pots instantly become the focal point of the room. 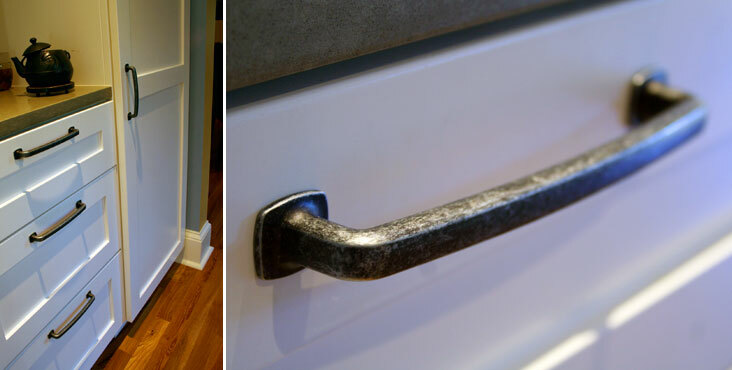 If I were to re-do my kitchen, which I'd love to do, I'd buy these drawer pulls. I'm drawn to their rustic, oversized, industrial style. They found them here. The feature Alice was most excited about sharing was one that was well designed and super functional, the best of both worlds. She explains, "We generate very little landfill trash due to recycling, composting and not buying a lot of packaged foods. Most designs focus on a large trash can area. Well, we flipped that on its head. We created a pull out cabinet where the taller space in the back is devoted to recycling and then we built a double decker receptacle in the front. We were tired of our compost pail being on the counter, so we integrated that over our small trash can to maximize the space. We cut a hole on the side to deposit trash and then a hole on the top over the trash can where the compost pail rests. The design has worked like a charm." There hasn't been a farmhouse sink I haven't fallen for. Alice and Melissa purchased theirs through Ferguson in Atlanta. I've always liked the idea of an outdoor sitting area just off the kitchen that allows for conversation to continue. Plus, it's just a few paces away to sit and enjoy a nice cup of coffee in the morning and talk to the chicks. 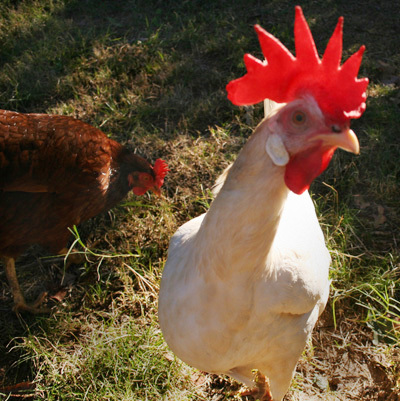 Also, if you live in or near Atlanta, be sure to check out the Urban Coop Tour this weekend.